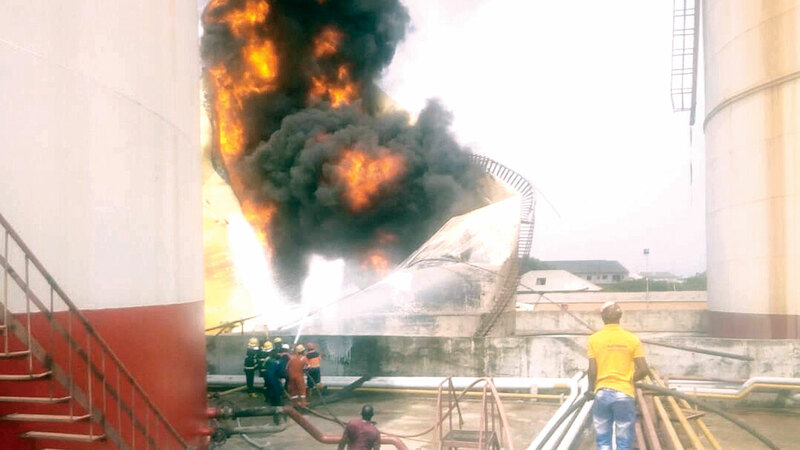 A wild fire yesterday razed an oil tank farm belonging to Stallionaire Oil at Ijegun, Satellite town, Lagos State. The fire, which went almost out of control, caused panic among residents of Satellite Town and Ojo area. Thankfully, no human life was lost. The Lagos State Emergency Management Agency (LASEMA) officials were able to contain the inferno by deploying state of the art emergency equipment. Spokesman of the agency, Adebayo Kehinde, who spoke with newsmen at the scene, said there was no need for panic as the agency had put adequate measures in place to ensure that the fire does not escalate. According to him, “the agency was alerted through the emergency toll free line 112/767 concerning a fire outbreak at Stallionaire Oil Depot, Ijegun Satelite Town. The agency activated its emergency response plan with relevant stakeholders. On getting to the scene, it was discovered the facility, which is a fuel depot comprising five tank farms, of which one was filled with PMS, exploded and resulted into a big inferno. The General Manager of LASEMA, Mr. Adesina Tiamiyu, said proper investigation would be conducted on the incident. He, however, emphasized the need for owners and managers of oil and gas companies to always ensure that proper emergency response plan is put in place in their tank farms. The inferno resulted in heavy gridlock in the axis, as vehicular and human movements were restricted.